Structures which are situated in warm nations all will be impacted by the warmth that is absorbed into the building through the roof. To be able to keep these structures cooler indoors, the owners of the building could opt for using reflective roof paint if ceiling insulation is not an option. Generally reflective roof paint can be quite costly, particularly in areas in which the warmth may become intolerable during the warmer seasons of the year. Building structures which have metal roofs are particularly vulnerable to being overheated throughout the summer time and dealing with the scorching hot heat during these summer seasons can be quite uncomfortable. To be able to help combat this problem, reflective roof paint may be used to help reflect some of the heat off your building. 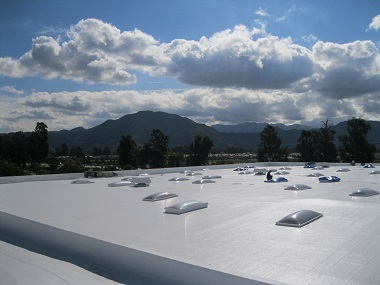 You will often find reflective roof paint applied to warehouses or big commercial buildings. It would still be better to use a bulk insulation for best results but a layer of reflective roof paint can be quite effective! Does reflective roof paint save money? The very first factor to consider with regards to saving cash with reflective roof paint is it reflects the direct heat away from your roof. 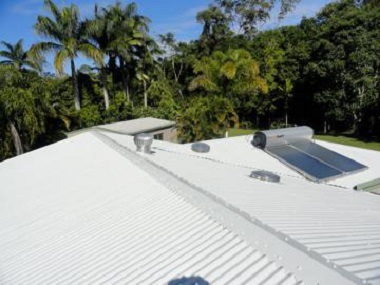 Metal or corrugated iron roofs can achieve staggering temps. Simply by coating an industrial metal roof in reflective roof paint will help the outer structure of the roof absorb considerably less solar heat than an uncoated roof, making your building way cooler inside. Which means that cooling costs is going to be decreased because the reflective roof paint doesn’t allow as much of the heat from outside to enter the building or warehouse. In addition to keeping the temperature lower inside your building or warehouse on hot summer days, reflective roof paint is supposed to help with retaining some of the heat you create inside your building during the winter seasons. It won’t have a huge effect on keeping the place warm in comparison to having your building properly insulated with a bulk roof insulation product but it could provide a small benefit. Cooling and heating costs can spiral in to the 1000’s of rand’s every year for business owners of huge structures, and that’s why a lot of business owners are making use of reflective roof paint to help assist with the heating and cooling bills of the building. How long does reflective roof paint last? When a fresh coat of reflective roof paint is applied to the exterior of a building, it should last anywhere in the region of around 10 – 15 years before a new coat needs to be re-applied, and because of this, reflective roof paint is considered a wise investment for a business owner. It may cost more than a normal layer of paint but it will be worth the cost of the reflective roof paint as it will save you money on heating and cooling bills during those years.